I’m a people person. Yes, I know that sounds like cheesy management speak but it’s true. I’m far more comfortable getting out and about, talking to staff and meeting people than I am being holed up in my office for hours on end – doing my chief executive type stuff! Although it might also be down to a profound dislike of paperwork. As a people person, I’m also a huge fan of celebrating human achievement. People are capable of amazing things. I’ve always believed that. And this week, a story I heard about one of our members made me believe it even more. Brian, a 70-year-old retired maths teacher, has just celebrated his 1000th session at the gym since suffering a heart attack 8 years ago. He’s become a regular face at the centre, working out for 90 minutes at least three times a week, his sessions involving time on the treadmill, bikes and rowers, as well as leg extensions, bicep curls, shoulder presses and wall push-ups. That’s some journey. Having never been “a gym goer”, it isn’t like Brian simply returned to old habits. Instead, he created a new reality by…quite literally…taking it one step at a time, building on his cardiac rehabilitation programme to set himself new exercise goals. Goals which have lead him to love finding new ways to stay active. In his own words, once upon a time he would never have been seen dead in a gym – now he is “very happy to be seen alive in one”. Brian’s achievements are brilliant. To come back from such a significant health hurdle and not only recover, but excel, is inspirational. It is also serves to put a few things in perspective. Earlier this year, Public Health England revealed that 41% of adults aged between 40 and 60 walk less than 10 minutes continuously each month at a brisk pace, despite the fact that just 10 minutes walking a day is estimated to reduce an individual’s risk of dying prematurely by around 15%, not to mention additional health and mental wellbeing benefits. A more recent US project, involving 70-to-90 year olds, found that adding just one extra hour a of moderate exercise to a weekly routine significantly reduces the likelihood of developing mobility disabilities. Another report, summarising over 39 national and international studies and published in the British Journal of Sports Medicine, has revealed that moderate exercise (aerobic and strength) three times a week improves cognitive functions such as memory, attention and task performance in the over 50s. The message is clear. Making sure we stay active as we age has positive health and wellbeing implications that are indisputable. It helps us live better and live longer. Age is no barrier to exercise, indeed, it is a reason to embrace it. So why don’t we? 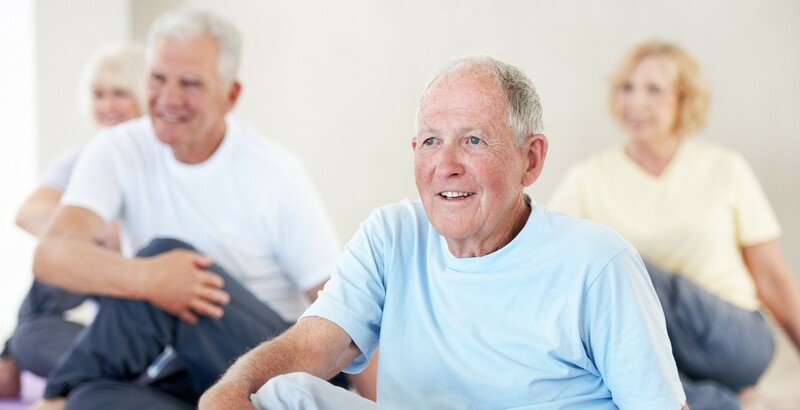 The reality is that we see Brian, a gym regular in his 70s, as an exception to the rule…the rule being that as we age, aches, pains and the natural wear and tear we all come by, means we are less able to be physically fit and enjoy exercise. So we don’t do any. And that needs to change. When is the NHS going to start talking, and I mean having serious conversations, with people like Brian to ask them one simple question – how did you do that? The answer could make a massive difference as it could help influence a national shift in mindset to establish a new set of rules where Brian is a trend setter and not a statistical anomaly. I’m all for it. And not simply because of external evidence. Because of personal experience. I turned 50 last year. I can’t lie, it’s a milestone I approached with some degree of trepidation – the big 50 tends to have this effect on people, especially men (though we try and hide it). But while it may have prompted me to view many things a little differently…my own reflection in the mirror for one… something that never even crossed my mind was ‘easing off the exercise’. And not because of my job or even my love of sport. The real reason is that exercise helped me overcome adversity to get to 50 in the shape I’m in. It could have been very different. A little over two years ago, I was diagnosed with two conditions – arterial fibrillation and an arterial flutter. Basically, my heart was beating way too fast even when resting and also out of rhythm. The diagnosis resulted in two significant operations. Back then I could have…and according to modern perceptions probably should have…cut down on running and the active lifestyle I had always previously enjoyed. But I didn’t. Instead, I decided to trust in the benefits of physical activity; trust in what I knew personally was good for me. And it worked. I did a little more each day and the more I did, the stronger and more mentally relaxed I felt. I just kept at it. Fast forward to this year. My 50th wasn’t the only thing I celebrated, I also qualified for and competed in the European Masters Athletics Championships. Don’t get me wrong. I’m not comparing my situation to Brian’s. But I do recognise in his story a common thread. Both of us are where we are today because of making a personal commitment to exercise. Staying active will be different for everyone. No two individuals are the same and it is important that people find whatever form of exercise they enjoy and a level they feel comfortable with. But the health benefits are universal. All that is needed for people to really feel those benefits is national realisation that getting older and staying active don’t have to inversely related…a rule change. We already know it, we just now need to make it happen – the NHS, leisure providers and members of the public working together to make a difference. As I mentioned earlier, people are capable of amazing things. Wouldn’t it be fantastic if one of those amazing things was deciding to approach aging a little differently? Come on NHS, have a chat with people like Brian and take a different approach to get things changing. Thanks to exercise he, like me, would certainly say age is just a number – it’s not a sentence to deteriorating health and forced inactivity.